Born in Montreal, and raised in the suburbs of Toronto, Deacon Stephen moved to Calgary with his wife, Marjorie, over 40 years ago with their (now adult) children: Joshua, a pilot who lives close by, and Elizabeth, who lives in Vancouver. A cradle Catholic and the oldest of five boys, he admits that he wandered away from the Church as a young man but, on a faith journey with his wife, came back to the Church 30 years ago. Marjorie, a former Anglican, desiring to receive the Eucharist, went through RCIA and was confirmed at St Pius X Parish in 1990. 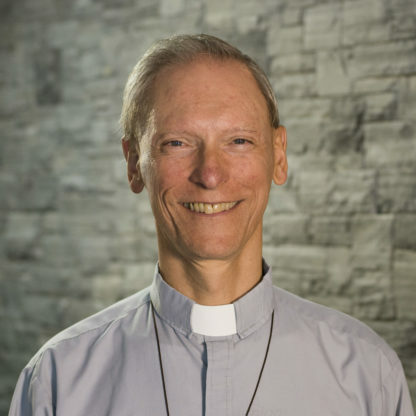 Working as a carpenter, then a building inspector with the City of Calgary, he later completed a degree in Communication Studies at the U of C and, at almost exactly the same time, was ordained to the permanent diaconate, just minutes after Deacon Tom, by Bishop Henry, in June of 2008. Having served at St. Pius X for 8 years and St Luke's for one year, Marjorie and the deacon are both absolutely thrilled to have been assigned to serve Jesus Christ in the great people of St. Peter's, under Fr. Jonathan's spiritual guidance. Although he has had satisfaction out of competing at triathlon, nothing compares with faith journey highlights, which have included pilgrimages to Rome, the Holy Land, walking the Camino de Santiago, and getting to do degree studies in our precious Catholic faith, at the Augustine Institute in Denver (home of the formed.org studies). Marjorie and Deacon Stephen have sometimes worked in ministry together, right now doing marriage preparation presentations to engaged couples, and possibly a Bible study at St. Peter's. He used to be 'Steve' to everyone who knew him. Believing that we all need great models of Christian commitment and holiness of life to follow, he now desires to identify with the first Christian martyr and the first named deacon, "Stephen, a man full of faith and the Holy Spirit" (Acts 6:5), to help him walk that path. And, whether sitting in the congregation at mass, or serving at the altar, our unity in the Body of Christ lifts him up when we say with one voice, "... I ask the Blessed Mary, ever virgin, all the angels and saints, and you my brothers and sisters, to pray for me to the Lord, our God."